Pay homage to your favorite metropolis with these hand embroidered cotton pillows. Whether you're a lifelong resident, a new arrival or just a tourist, pay tribute to a great city with one of these hand embroidered pillows. Splendid conversation pieces in the home or office, they feature the attractions, neighborhoods and culture of America's bustling towns. Each features hand embroidered pictures, black velvet piping and a soft polyfill. Handmade in India. Click here to view a full list of available Hand Embroidered City Pillows. Large pillow, nice quality, great colors and illustrations. Since it is so large, we have it as decoration on a sofa in the office (where we don't sit as often). It is definitely expensive for what it is. It is a gift for someone who is retiring. It was expensive for a pillow, but it certainly says a lot about the city of Pittsburgh! The pillow is used as a decorative piece on a black sofa and it really looks nice as it adds some color and interesting design. The colors are not nearly as bright as was shown in the picture, something that was a bit disappointing. However, the colors ended up working really well in this room so it was okay. The pillow is a great keepsake of our home town. It's unique, colorful and has all the major features of home. Very well made attractive pillow. It is advertised as hand made and while high quality appears the same as a mass produced machine made pillow. It might be better to have them machine produced and reduce the price a bit. Purchased as a closing gift for a client from Chicago buying a second home in Florida. They loved its unique nature and the familiarity of places from their hometown. Appears to be high quality and exactly as portrayed on the website. Adds perfect color to my black couch. Reminds me of my time living in that great city! Highly recommend. Either as a sofa throw-pillow or as a wall/shelf display piece, it readily invites attention due to bright colors and imaginative design. 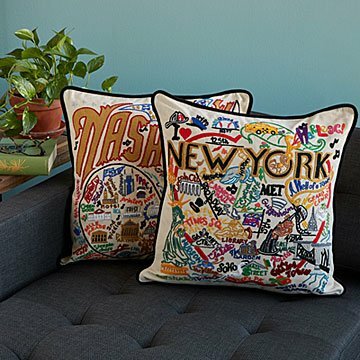 Most of Manhattan places of interest are depicted - so for a visitor or resident of New York City, the pillow serves as memorabilia in a grand way.